Hi everybody! I’m very excited to introduce you to another non-Korean recipe that I filmed with my reader Mariksa in Jakarta, Indonesia! Gado-gado! Mariska is showing us how to make the west Java style gado-gado because she was born and raised in West Java province. There are many regional variation for gado-gado, just like Korean kimchi. Mariska created her own cooking show channel on YouTube! 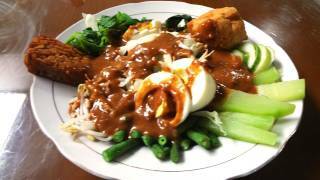 The other day, I followed the recipe and made delicious gado-gado. I’m always happy to learn a new dish that I am not familiar with. Making gado-gado sauce is very easy if you use a food processor like I did. Following her recipe is my version. The cameraman is Mariska’s cousin Reginald Evan. I hope Mariska keeps posting her authentic recipes on YouTube so that we can learn Indonesian home cooked food. I think all of you are just like me and very interested in homecooked recipes. Grandmothers and mothers make food for their family. You know why? Their cooking is based on true love! When you make food with love, the food should be delicious! 1 thinly sliced medium sized fresh cucumber, 2 fried tempeh (soybean patties), 2 pieces of fried tofu, and a hard boiled egg cut into 4 pieces. Blanch and strain Chinese spinach, water spinach, string beans, mung bean sprouts, cabbage and slice 1 cucumber. Grind these ingredients with a mortar and pestle until they’re smooth: 1 ts salt, 2 ts dried shrimp paste, 3 red bird’s eye chilis, and ¼ cup’s worth of palm sugar. Add 1 cup of finely ground roasted peanuts (or 1 cup of peanut butter) and grind it all some more until it’s mixed well. If you use peanut butter instead of ground roasted peanuts, add less salt because there’s salt in the peanut butter. Mix 1 tbs (about 20 grams) of tamarind with ¼ cup of hot water in a small bowl. Add the juice to the sauce. Add ½ cup of water and mix it well. Transfer the vegetables to a serving plate and pour the sauce on top of it or mix all the vegetables with the sauce in the mortar before serving. Add a sliced hard-boiled egg on top and garnish with fried shallots, shrimp crackers and emping. Grind 1 cup of roasted peanuts, 1 ts salt, 2 ts dried shrimp paste, 3 red bird’s eye chilis, and ¼ cup’s worth of palm sugar in a food processor until smooth. In a bowl, mix the blanched vegetables with the sauce. Transfer to a serving plate. Garnish with fried shallots, shrimp crackers, and emping. I used my food processor to make the sauce which was very easy and turned out great. For those of you who are not familiar with some of the ingredients used in the sauce, I’m posting some photos of the key ingredients below. You can find dried shrimp powder, tamarind, palm sugar, and fried shallots in Chinatown. 1 chunk of palm sugar (about ¼ cup). To use this, put it in a small pot, add ¼ cup water, and heat it up. Break it into small pieces with a wooden spoon until it’s well melted. Frying krupuk (prawn crackers) in heated vegetable oil. This is very fun to make. You will be surprised how rapidly it grows. Posted on Friday, January 6th, 2012 at 1:08 pm. Last updated on April 26, 2015. Posted January 4th, 2019 at 6:57 am | Log in to reply. Hi Maangchi! Love your videos so much. Recently had a banchan at a restaurant here in the DC suburbs that the waitress told me was chayote squash. Do you have a Korean recipe with this veggie? It is so tasty! Posted December 1st, 2013 at 10:19 am | Log in to reply. There are three additional vegetables needed to make really authentic Jakarata gado-gado. Shrimp paste is a must. If we do not use shrimp paste, the aroma will be authentic. Looking at the video, she is up to Jakarta style gado-gado, not West Java gado-gado. In the Jakarta gado-gado, chinese spinach has never been part of the ingredients. You can skip that particular vegetable. Fried shallot and crackers are not optional. I’d rather not eat gado-gado without those two. Posted March 9th, 2012 at 8:42 am | Log in to reply. Posted January 12th, 2012 at 9:00 am | Log in to reply. Posted February 18th, 2012 at 9:52 am | Log in to reply. Posted January 8th, 2012 at 1:57 pm | Log in to reply. Posted January 9th, 2012 at 11:30 pm | Log in to reply. Posted January 7th, 2012 at 12:27 am | Log in to reply. Maangchi you are no doubt such a great cook, your gado-gado looks like just original. That was wonderful !! – Tofu : You can use any tofu (even soft tofu, though it’ll be a little too soft) and then fry it yourself. – Sauce : Shrimp paste is optional (it’s my first time hearing it actually). You can replace tamarind with vinegar, but the taste will be a little bit different, because beside sour, it also has this unique taste. Chili is a must for spicy lovers. – Garnish : Fried shallots or crackers is to balance the gado-gado, that’s why it is recommended but still optional. That’s all I guest, have fun in making gado-gado !! Posted January 7th, 2012 at 1:40 pm | Log in to reply. Tamarind already has a strong sour taste, if you mix it with vinegar it will be turn out very sour. Just pick one of them. Posted January 15th, 2012 at 6:08 am | Log in to reply. I miss Indonesian’s food so much!!! @Ryan : haste schon mal im asiatischen Laden gesucht? Du kannst ja auf jeden Falls Online kaufen, oder? Posted January 20th, 2012 at 2:05 pm | Log in to reply. I start to write my recipe in my tumblr. simply click my name, it direct link to my tumblr. Posted January 24th, 2012 at 4:59 pm | Log in to reply. do you mean the shrimp paste ?! I can’t really say for sure whether they sell it or not and as I said in my previous comment, that was my first time hearing that gado-gado is actually using shrimp paste. I actually grew up in the same town as Mariska, but never knew about the shrimp paste in gado-gado, never mind anyway, I’m actually also curious of the taste of this version. Posted January 24th, 2012 at 5:06 pm | Log in to reply. Posted February 17th, 2012 at 11:08 pm | Log in to reply. its too sweet for me because i already add the palm sugar on the sauce. :D so far i know kecap in english is sweet soya sauce, :s *confuse* which one is right? Posted January 6th, 2012 at 3:17 pm | Log in to reply. Ah, Indonesian.. My second favorite cuisine. This looks absolutely fabulous, Maangchi. I will need to see if I can gather up all of the ingredients for this at the limited number of Asian markets I have available to me in Iowa. The only question I have is the Fried Tofu and tempeh is something I don’t remember seeing (but I will look) locally.. can either of these two ingredients be made from Tofu and or any sort of soybean if I cannot find it? Posted January 7th, 2012 at 1:40 am | Log in to reply. Posted January 9th, 2012 at 3:15 pm | Log in to reply. Try hit the chinatown in downtown Chicago , there was this store called Golden Pacific , they sell tofu , fried tofu , shrimp powder and shrimp paste , raw peanuts , and tamarind , basically all the ingredients you need to make this yummy gado gado . I think it’ll be closer to Chicago than driving all the way to Madison :D Oh and yes they do sell tempe too .. but you will have to fry them yourself :) hope that helps ! Posted January 9th, 2012 at 3:16 pm | Log in to reply. oops sorry not the chinatown , but just downtown , the store is located on the north side . Posted November 9th, 2012 at 8:45 pm | Log in to reply. Posted January 6th, 2012 at 1:50 pm | Log in to reply. WOW!!!! ♥ ♥ Your sauce is looks so delicious! Posted January 7th, 2012 at 12:13 am | Log in to reply. This recipe was originally posted on January 6, 2012 at 1:08 pm by Maangchi. It was last updated on April 26, 2015. The video was watched 264,075 times on YouTube & has 2,587 likes!